What inspired you to “dibs” this poem? Artist Undine Brod: Mostly I think I was drawn to the imagery that floated in my mind when I read the poem for the first time. Further, I was drawn to reading the poem voer and over because it talks about how words aren’t enough, aren’t clear, limited and yet this art form—poetry—is all about words. Poet Susan Rich: I love the fusing of woman with pumpkin; the long backbone of corn. While the poem offers: They survey squash plants and corn stalks, I love how Brod emphasized this. Also, the woman from Vitez, the woman the poem is dedicated to, was in her fifties. In the broadside she appears as a young girl. I think she’d like that. Initially, I was uncomfortable with the lack of color in this piece because I see the watermelon as central. The poem comes to me in variations of green, red, and black. However, with a little distance, I am enjoying how differently the artist experienced my work. It is a pleasure (and an honor) to see the poem illustrated. What first leapt out at you from the poem and what was your gut response? Artist Undine Brod: The imagery of fruit and that it was about a relationship. Poet Susan Rich: For me, the poem exists in a precise moment in time. As I read the poem, I re-experience one midsummer afternoon in August, about four ‘o’ clock. The green of the garden is almost holy, the road beyond the gate, empty. I know it was late afternoon as I remember the call to prayer coming from the mosque as my hosts proposed a toast, raising their shot glasses. That long afternoon, which led to the poem many months later, is the poem. The piece works as a memory trigger. I guess I expected that the artist would be there beside me. And perhaps she was, but in a different way. Artist Undine Brod: Lately, I have been working with varying elements that I “play” with until I see how two or three, or more parts come together to create a narrative or a character with an unknown story. To create an image to go with this poem I worked in a similar manner but used specific words from the poem to select the elements that I would bring together to create story. Poet Susan Rich: I realized that this poem works as a memory trigger and I bring to the piece many details that don’t exist on the page. Once I got over my ownership of the poem, I could really enjoy the interpretation that Undine created. Artist Undine Brod: When I have worked to create a piece specific for a poem I am always surprised at how much the poem changes with each reading. I spend time reading over and over it and within moments I can see something completely new. If your poem were a food dish, what would it be? Poet Susan Rich: A late harvest salad savored in the aftermath of war. If it were a film, it might be “Babette’s Feast” with many delectable courses stretching out over a seemingly endless summer. If your art were a food dish, what would it be? Artist Undine Brod: A buffet, which I know isn’t one particular food dish, but rather all of them brought together from which a person self-selects. If the broadside collaboration were a food dish, what would it be? Artist Undine Brod: Hmmmm, there are so many possibilites because I see this as two parts that come together to make a whole, much like a pasta dish with a specific sauce or a hot dog that has its own bun. I also think in the realm of a food dish that has a main component and then a covering similar to a tamale and I try to figure out which is what—do the poems contain the art or does the art become the containment because it gives the poem a place. Poet Susan Rich: At the moment, I am starting a project based on the work of a nineteenth century woman photographer and painter. One poem will appear this year in Third Coast. I am finding the experience a welcome challenge. It is a difficult negotiation to balance my own interpretation with what images are before me. The photograph exists on the surface and also in the photographer’s mind. I believe there is always an ongoing tension between the two. I want to re-imagine the art while at the same time doing honor to this photographer’s vision. If this woman were still alive, I’d want her to be interested in my poems and not feel violated by them. 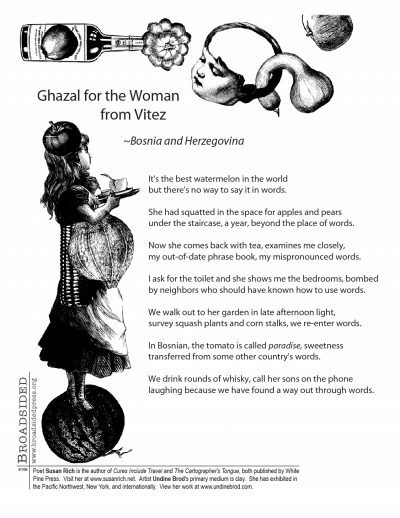 If you had to represent the Broadsided of “Ghazal for the Woman from Vitez” with one word, what would it be? Artist Undine Brod: This is too hard for me to answer because it would depend upon which specific reading of the poem at a specific time that I would be referring to, not a word that can stay the same across all readings. Poet Susan Rich: Yes, The Cellist of Sarajevo, by Steven Galloway is an exquisite novel set during the Bosnian war. Galloway’s prose are gorgeous, the kind of book that you will want to read again for the pure joy of language. Artist Undine Brod: But of course! Artist Undine Brod: And most definitely! Poet Susan Rich: I’d love to hear from any vectors that post this. My poems often focus on places in the world I’ve lived or worked: Bosnia, England, Gaza, Niger and South Africa, to name a few. I would love to think of my work traveling there as well. I love the community created through artist, writer, internet, and the physical world. Brava Broadsided! Artist Undine Brod: Were my answers to the last two not specific enough…. Poet Susan Rich lives in Seattle. She is the author of Cures Include Travel, published by White Pine Press. Her book The Cartographer’s Tongue, Poems of the Worldwon the PEN USA Award for Poetry and the Peace Corps Writers Award. Her poems appear in the Alaska Quarterly Review, Gettysburg Review, Poetry International, New England Review and Quarterly West. Susan has worked in Bosnia, Niger, and Gaza on behalf of human rights. “Ghazal for the Woman from Vitez” is published in The Cartographer’s Tongue. Visit her at www.susanrich.net. Artist Undine Brod earned a BFA in Ceramic Art and a BA in Interdisciplinary Art from the University of Washington. Currently she lives and works in New York City and has exhibited her work in the Pacific Northwest, New York and internationally. Image: 8″ x 11.5″; paper collage.